My below four works (QuickTime Movie) for my practice. 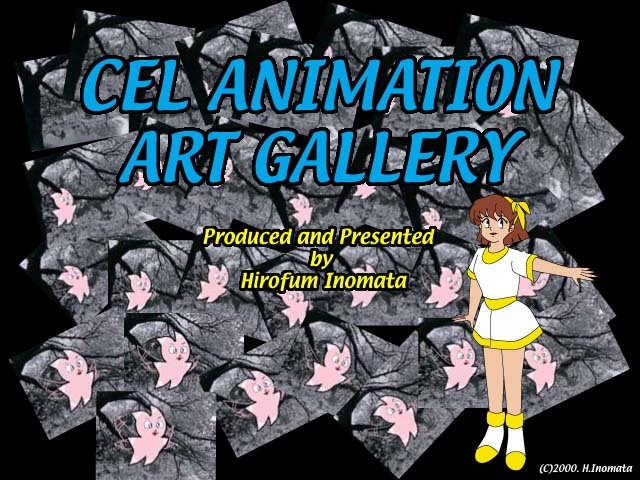 This site is not presented by either a buyer nor a dealer of animation CEL pictures. At least, Auther of this site am a collecter and making animation. I have very great interest in an inbetweening for Japanese Animation. I make this site for collecting samples (for my educational use) of the inbetweening. I would like to know a mechanism of object motion in a cel animation. I have already known a method using 3DCG and toon shaders. However, I feel that a work by the method is a little different from a hand-making one. I would like to know what is different. I prohibit you use image data (or files) in my site without any permission. This use includes any exhibition, transferring to any media, and so on. For your needs, you should say only my url, "http://www.bekkoame.ne.jp/~inomata/outer/cell/", instead of the image data in my site. I allow you to link your site only to the url, "http://www.bekkoame.ne.jp/~inomata/outer/cell/" You may use my below banner image for your link. However, I prohibit you link as denying my policy for my educational use.